McConnell J. (1986) “The Management of Chondromalacia Patellae A Long Term Solution” The Australian Journal of Physiotherapy 32(4), 215 223. McConnell J. (1991) Fat pad irritation a mistaken patellar tendonitis, Sport Health, 1991. McConnell J. (1993) The value of the SLR, commentary Physical Therapy, May. Crosbie J. & McConnell J. (1993) Key Issues in Musculoskeletal Physiotherapy. Butterworth Heinnemann. McConnell J. (1996) Management of patellofemoral problems Manual Therapy 1,5-9. McConnell J, Gresalmer R, (1998) The Patella – A Team Approach. Aspen Publications. McConnell J. (2000) Patellofemoral management in Knee Ligament injuries. ed Ellenbecker T. Harcourt Brace. McConnell J. (2000) Neuromuscular rehabilitation strategies for the shoulder girdle. In rehabilitation of the shoulder ed Tovin B. Churchill Livingstone. Crossley K, Cowan S, Bennell K, McConnell J (2000) Patellar taping: is clinical success supported by scientific evidence. Manual Therapy 5(3),142-150. McConnell J. (2002) The physical therapist’s approach to patellofemoral disorders. In Injuries to the extensor mechanism of the knee. Clinics in Sports Medicine 21(3):363-87; ed D. Fithian. McConnell J. (2002) Recalcitrant chronic low back and leg pain – a new theory and different approach to management. Manual Therapy;7(4):183-92. Crossley K, Bennell K, Green S, Cowan S, McConnell J. (2002) Physical therapy for patellofemoral pain: a randomized, double-blinded, placebo-controlled trial.Am J Sports Med.;30(6):857-65. Cowan SM, Bennell KL, Hodges PW, Crossley KM, McConnell J. (2002) Physical therapy alters recruitment of the vasti in patellofemoral pain syndrome. Med Sci Sports Exerc.;34(12):1879-85. 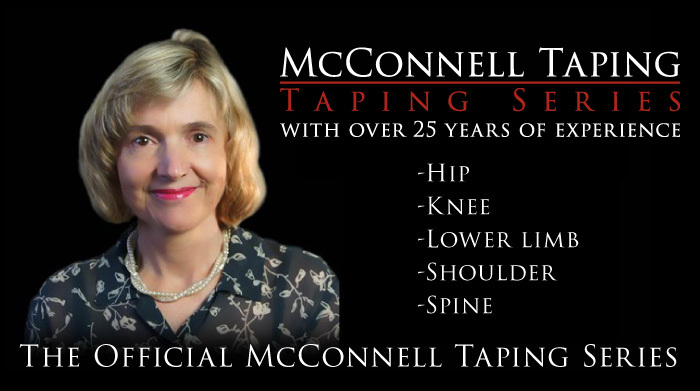 McConnell J (2003) The use of taping for pain relief in the management of spinal pain in Grieve’s Modern Manual Therapy of the Vertebral column 3E ed Boyling and Jull due early 2003 -Harcourt Health Services. McConnell J. (2003) Patellofemoral problem with significant biomechanical contributing factors in Clinical reasoning for Health Professionals. Eds Jones M. Rivett D. Butterworth Heinnemann..
Cowan SM, Bennell KL, Hodges PW, Crossley KM, McConnell J. (2003) Simultaneous feedforward recruitment of the vasti in untrained postural tasks can be restored by physical therapy. J Orthop Res.;21(3):553-8. McConnell J, (2003) Mattresses for a pain in the back. Lancet. 362(9396):1594-5. Crossley KM, Cowan SM, Bennell KL, McConnell J (2004) Knee flexion during stair ambulation is altered in individuals with patellofemoral pain. J Orthop Res;22(2):267-74. Kilbreath SL, Perkins S, Crosbie J, McConnell J. (2006) Gluteal taping improves hip extension during stance phase of walking following stroke. Aust J Physiother:52(1):53-6. McConnell J. 2007 Rehabilitation and nonoperative treatment of patellar instability. Sports Med Arthrosc.15(2):95-104. McConnell J 2011 Hip strength and knee pain in high school runners: a prospective study PMR.;3(9):802. McConnell J, Donnelly C, Hamner S, Dunne J, Besier T. 2012 Passive and dynamic shoulder rotation range in uninjured and previously injured overhead throwing athletes and the effect of shoulder taping. PMR.;4(2):111-6. McConnell J. 2012 Management of a difficult knee problem. Man Ther. Jun 27.